Use an irrigation schedule from below for the city that is the closest match to your local climate. No irrigation schedule is perfect. 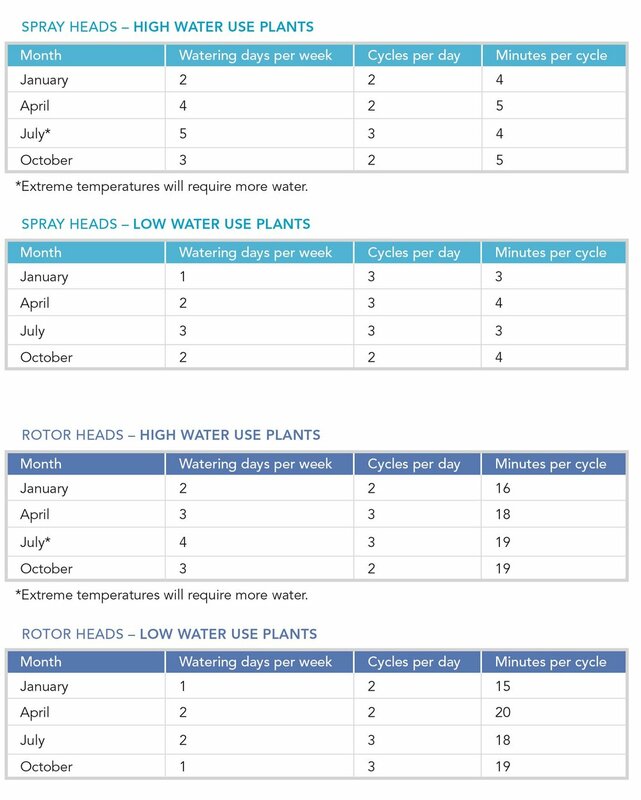 These are suggested schedules for watering high and low water-use plants with spray and rotor sprinkler heads. Results will vary depending upon the condition and layout of your irrigation system, and the physical characteristics of the land and soil. These schedules are meant only as a guide. Individual sites vary and will need to be adjusted accordingly. In other words, don’t be afraid to take a trowel to your soil and see how deep your irrigation is going. Your goal is to irrigate enough in one day to soak just past the root zone, then let the soil dry down a few days. The best time to water is in the early morning hours. Allow 30 to 60 minutes between watering cycles so water has a chance to soak in the soil. The heavier the soil, the longer the soak time needed. As water needs increase, don’t add time to the cycles, or you will get runoff. Instead, add cycles if a small increase in watering is needed. Otherwise, add watering days. For those of you who like details, the schedules are based on the following information. Irvine, Pomona, Riverside, and Hemet. The schedules assume no rain. Obviously, if you get rain, you can turn off your controller for several days to several weeks or more. Mountain communities like Big Bear have a historical annual average ETo of 51.4 inches. They average 20 inches of rain and 67 inches of snow annually. Big Bear’s rain and snow totals exceed the ETo for the year, but most of the precipitation occurs in winter. Therefore, some irrigation may be needed during the summer—especially for non-native plants. High water-use plants = cool-season turf grasses such as tall fescue. Lawns don’t need water every day except in extremely hot weather. Cool-season turfgrass can function normally down to 80% of ETo (unless it gets extremely hot). The high water-use category was calculated at 100% of historical average monthly ETo. The low water-use category was calculated at 50% of historical average monthly ETo. In reality you will be effectively irrigating at less than the calculated ET percentage because no irrigation system is 100% efficient. Soil texture = heavy, slow draining soil. If you have faster draining soil, then less cycles of longer duration can be used. Precipitation rate of rotor heads = 0.4 inches/hour. 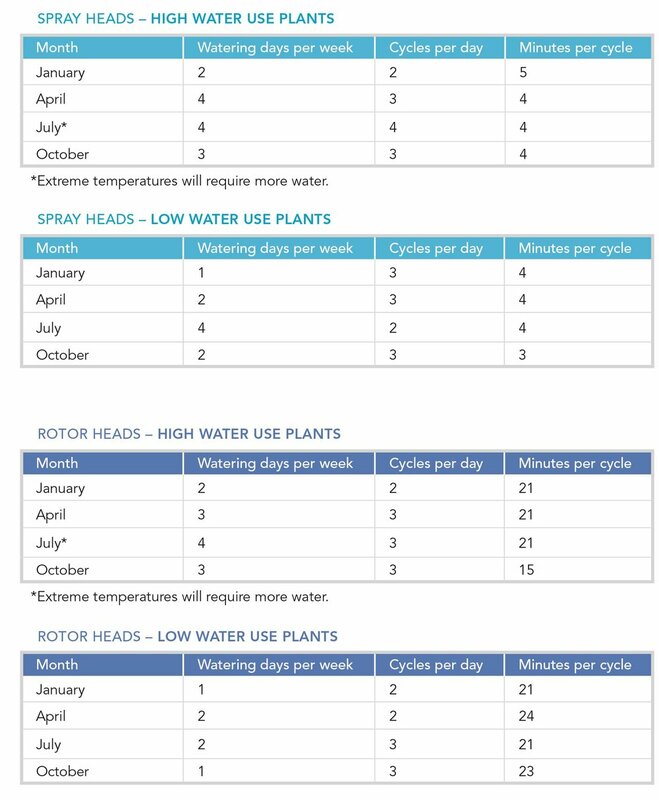 For the purposes of calculating the irrigation schedules, a rotor head can be single stream or multi-stream, multi-trajectory. The precipitation rate of these types of sprinklers can vary quite a bit depending on nozzle size and adjustments. The precipitation rate of 0.4 inches/hour was used for calculating the irrigation schedules. Drip in a grid pattern = 1.44 inches/hour if in a grid pattern of tubing with 1 gallons-per-hour (gph) emitters spaced 12 inches apart. This looks like you can irrigate with drip for just a little more time than spray heads. However, if drip is going to be used to irrigate shrubs or trees, the run time will need to be about 30 minutes to reach a depth of 12 inches and one hour to reach a depth of 24 inches, depending on your soil texture. If your soil is heavy or clay-like, you will need to break up the watering time into two or three cycles to avoid runoff. Additionally, because you will be watering deeper than a few inches, you do not have to water as often. This is where a soil moisture meter can help you. 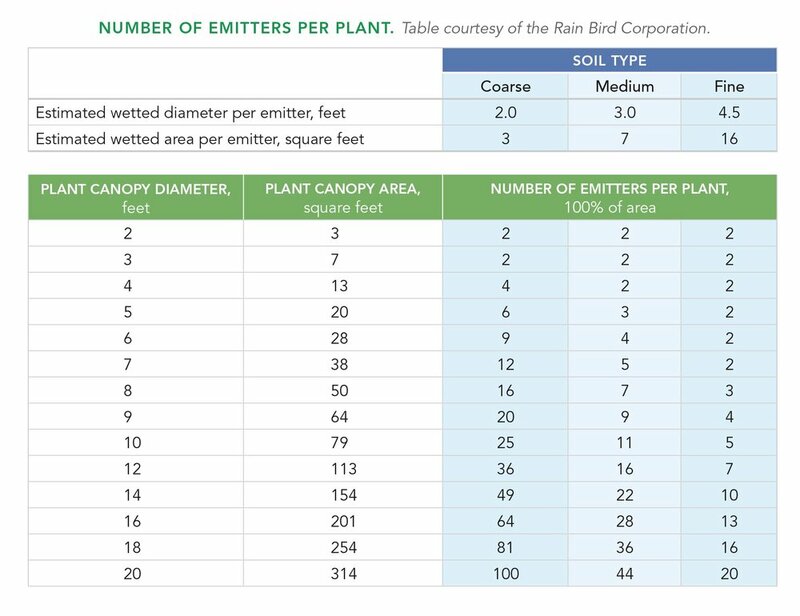 Point-source drip irrigation is calculated using emitters per plant size.